Well it's that special night of the year when mostly everyone gets a little bit freaky! Happy Halloween! Here is an offering from the Waen Brewery (not sure how to pronounce it!) in Powys. Apparently it's a chocolate stout with a decent punch of lime flavour through late hopping. It sounds like this 5.5% volume stout would be perfect for a dark stormy night, although it's still quite cool outside and I did rather enjoy a good swim outside at the gym this morning. Who knows, maybe it'll get spookier out there as it gets darker, but I can't see that we'll get any scary thunder a lightning! We are expecting lots of Trick or Treaters tonight and we have a big bowl of sweets for them to pick from. Yes, it’s that strange night of the year that adults encourage kids to talk to strangers and take sweets off them. 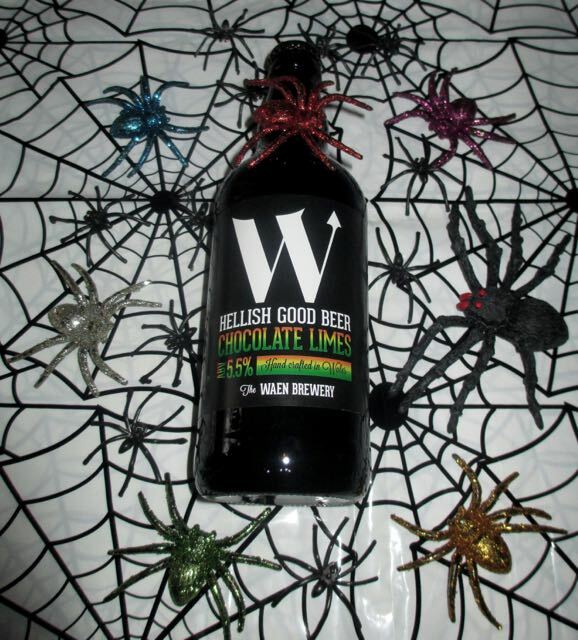 Personally I'll be drinking off the rest of this Hellish sounding Chocolate Lime stout. On opening the bottle there was a deep dark chocolate smell with a citrusy lime at the back of the aroma. Once poured I gazed at the black stout in my beer mug. It was like staring through the gates of hell into the shear blackness of oblivion. Rolling tides of nothingness threatened to envelope me as I raised my tankard to my mouth and took a tentative sip. I could almost feel dark devilish fingers grasping at my soul promising damnation. Scorn oozed from my mug as my lips met the black liquid and somewhere in the deep dark distance of the eternal depths (of my beer mug... I wish!) I'm certain I heard the grating of rusted chains and the most demonic evil laugh... Mwah... Hah hah haaaa... Heart thumping in my chest my tastebuds awash with rich dark chocolate malt and then the citrusy lime flavour scraped my senses like knife sharpened fingers across a black board. This is definitely a freaky brew made in the deep dark blackness of beyond. Not for the faint hearted. And for all those out there that love this time of year I have but one single word for you... Boo!